Pomegranate seed oil is a natural oil that has powerful antioxidant properties and therefore it is great for preventing premature aging. 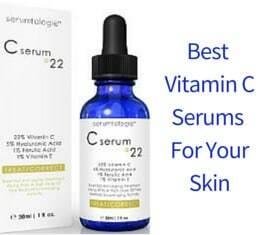 It also has a number of various other benefits for your skin’s health and beauty. 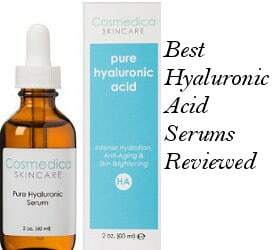 It has anti-inflammatory properties, fights free radicals while revitalizing skin and helping to fight acne. It is rich in vitamins and also contains calcium, selenium, potassium, magnesium and others. One of the first serums I used in my mid/late twenties and I went on faithfully using for quite a long time was Pomegranate serum from Weleda. I liked the way it conditioned my skin without drying it out but it was also an effective product against premature aging. It also gave me a light firming of the skin. So, pomegranate is a wonderful skin care ingredient to look for when selecting effective anti aging skin products and therefore choosing the best Pomegranate Seed Oil as part of your skincare routine can be a great option. Pomegranate seed oil can be used alone, combined with other oils, or added to your skin care products to help improve the overall look and feel of your skin. 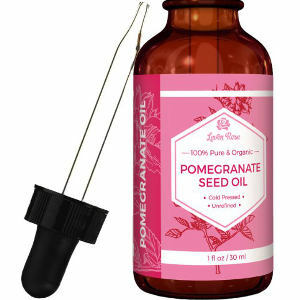 Here is a look at some of the Best Pomegranate seed oils for skin I have selected based on the good reputation of the manufacturer company and top user reviews. Leven Rose natural oils are quite popular as most people like the quality of this company’s different oils and the fact that they are natural and free of harmful ingredients. The Leven Rose Pomegranate seed oil is a therapeutic grade cold pressed and organic oil which comes in a 1 ounce dark amber glass bottle with a glass applicator. It is high in Omega 5 fatty acids and is clear in color.According to the company, this product promotes cell renewal, improves skin´s elasticity and diminishes fine lines and wrinkles. It absorbs quickly, leaves the skin soft, and is great for oily as well as dry types of skin. It is even beneficial for hair, naturally revitalizing and adding shine to the hair that is dull. In addition, the company is so sure about the quality of their products that they offer a 100% full money back guarantee. Reviews for the Leven Rose Pomegranate Seed Oil are exceptionally good with users finding many benefits when using this oil on their skin. They like that it is pure and contains no additives or fillers. It absorbs well into the skin and helps to clear up blackheads and generally their skin pores. Users also like that it doesn’t feel greasy and leaves their skin feeling silky smooth and glowing. People with eczema say it is an amazing product to use for their tricky skin condition. Weleda is a certified natural and organic skin care company founded in Germany in 1921. I have used a lot of their products and their quality is always top-notch. Weleda is also one of the few companies that are Demeter Certified, meaning that they use Biodynamic ingredients. Demeter Certification is a tough to get certification, guaranteeing that the ingredients derive from plants that are cultivated in the purest environment and picked at the peak of their growth. 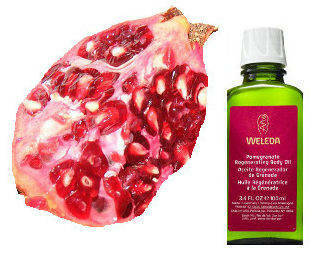 According to the company claims, Weleda Pomegranate Regenerating oil is an intensively nourishing moisturizing oil which soaks deeply into the skin to promote renewal of the skin, preserve its natural moisture, improve firmness and protect against the free radicals damage. It is 90% organic and according to dermatological tests conducted, this oil speeds up the natural renewal of the skin cells by 50% in only two weeks. It comes in a 3.4 ounce green bottle and its key ingredients are Pomegranate seed oil, Macadamia nut Oil and millet seed extract. Of course, it is free of useless chemical fillers since, as we have mentioned, it is certified natural. The fragrance of this oil, as described by the company, is sophisticated and fruit inspired from the pure essential oils contained in it. Reviews for the Weleda Pomegranate Oil are excellent. Users find that this product really hydrates their skin relieving dry or dehydrated skin while leaving it softer. It also relieves minor itching and leaves their skin looking younger and more dewy. People say it has a nice scent, absorbs into the skin well and leaves no oily residue behind. The Botanical Beauty company makes natural and healthy skin care products for men, women and children. The Botanical Beauty Pomegranate Oil is beneficial and can be used not only on the face but on the body and hair as well. It comes in a 1 ounce bottle and, according to the company, it is 100% chemical free and refined. 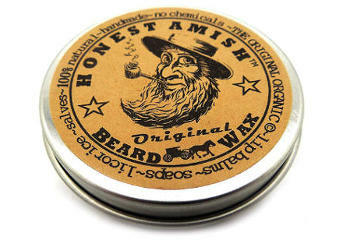 It is also unscented and comes in an amber glass bottle with a dropper applicator. According to the company, this product will improve your skin´s elasticity, reduce wrinkles and encourage skin cell regeneration. It is also good for cases of eczema, psoriasis and sunburn. 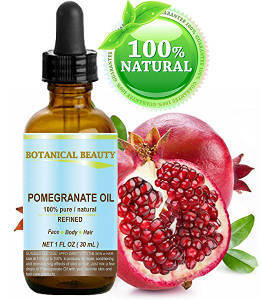 Reviews for the Botanical Beauty Pomegranate Oil are very positive. Users mention that this oil is lightweight and odorless, and love the fact that it is pure and natural. They also like the fact that it absorbs well into their skin and helps to protect it from sun damage. Its anti-inflammatory properties help to heal their acne and people say that it evens and brightens their skin tone as well as improves their overall skin texture. Lagoon Essentials is a company that makes natural carrier oils for your hair, skin, face and nails. 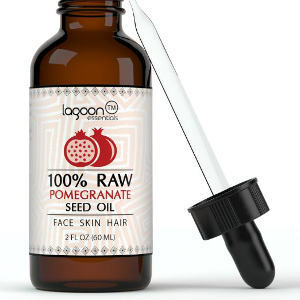 The Lagoon Essentials Pomegranate Seed Oil is a 100% raw virgin, unrefined cold pressed natural oil that is imported from Turkey and is bottled in the USA. It comes in a 2 ounce amber bottle with a dropper applicator. According to the company, this oil smoothens wrinkles while strengthening you skin. It is also good for dandruff and stimulating hair growth. Together with a full money back guarantee, a free e-Book with some tips on the benefits and use of Pomegranate oil is offered to you when you purchase this product. Reviews for the Lagoon Essentials Pomegranate seed oil are quite good. People like that this oil is extremely moisturizing and absorbs well into their skin. It also really eases their sunburn and reduces acne. Some users report that it slows down skin signs of aging and even lightens the appearance of scars. In addition, it helps their skin feel rejuvenated. John Masters Organics is a company that is dedicated to providing you with all natural hair, skin and body products that make you feel and look better and healthier. Their Pomegranate facial nourishing oil contains a blend of 12 organic and natural essential oils that nourish dry skin. It comes in a 2 ounce amber bottle with a dropper applicator. Some of the natural oils it contains are sunflower oil, olive oil, evening primrose oil, pomegranate seed oil, sweet almond oil, carrot oil, citrus peel oil and others. Reviews for this natural blend oil are very positive with users saying that it absorbs quickly into their skin, leaving it soft and supple while at the same time evening their skin tone. This oil goes on smoothly, doesn’t feel greasy and leaves their skin feeling moisturized and glowing with health. 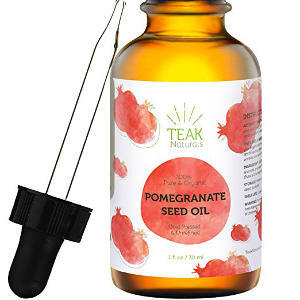 The Teak Naturals Pomegranate Seed Oil contains only one ingredient and that is Pomegranate. It is also free of parabens, fragrances, fillers and other additives of any type. It comes in a 1 ounce dark amber glass bottle with a glass stopper and is followed by a full money back guarantee. According to the company, this oil has top anti-inflammatory as well as anti-aging properties but is also great for unclogging pores, leaving your skin nourished, soft and radiant. Users are pleased with the quality of this natural product. They report that it is of a medium thickness and works well to moisturize the skin and make it supple. It doesn´t leave the skin greasy and some people have also noticed some difference with their wrinkles and fine lines. All in all, choosing one of these best Pomegranate Seed Oils will provide your skin with strong anti aging benefits as well as other advantages, as we have seen in this review. Due to its antioxidant properties, Pomegranate oil is effective for premature aging, and the fact that it is good for both dry and blemish prone skin is great especially for people that their skin is oily with dry patches and for people, of course, that have either oily or dry skin type. Nevertheless, it is good to know that Pomegranate seed oil is suitable for all types of skin.